Where To Get Custom Stickers Printed? Need custom stickers? Here are 5 tips worth considering as you shop around and before you type “cheapest custom stickers” into the search box. 1) Be clear on what you need custom stickers for. There are many styles of “custom stickers”, many different material options and different print methods. Make sure you communicate where the stickers will be used, the degree of adhesion needed and how long you want them to hold up. 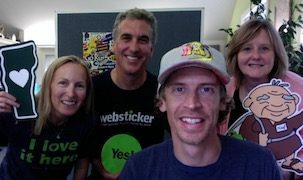 2) In order to communicate exactly what sticker you need and get the best prices, I recommend working with real people who really know their sticker stuff. Not a call center in India. Not an automated on-line system. Not a promotional products distributor who handles thousands of different products. But, the people actually doing the design work and guaranteeing the final product. Make sure the sticker company representative is listening and asking the right questions. 3) Check that a sticker company has access to multiple production methods and is not just recommending their method by default. Different print methods make sense not only for various purposes, durability and price, but also for the quantity needed. For instance, some digital methods make sense for smaller runs but become overpriced at larger quantities. 4) Don’t forget that image matters. Not only does the quality of the sticker need to be right for your needs, but the layout and design should be optimized for the best value. Can you get free design help from professional designers? Can you get proofreading services? Can you get suggestions on improving your designs? Will you see electronic proofs and be able to make as many alterations as necessary to get the sticker design just right before ordering? 5) Does the sticker company have a guarantee? Do you believe it? Do you trust and believe in the people you are working with? So, to sum up – know what you want out of your custom stickers (other than a great price) and only deal with sticker specific companies with knowledgeable people who will listen, offer design assistance, have access to multiple production methods and guarantee their work and time frames 100%. Perhaps not needed in every case, but, that’s the way I see it. HI JEFF….I RECENTLY ORDERED A COUPLE OF HUNDERED BUMPER STICKERS THAT I DESIGNED FROM A WELL KNOW ON-LINE STORE. MY PURPOSE WAS TO HAND THEM OUT TO MY CUSTOMERS THAT BOUGHT PUPPIES FROM ME. THEY WERE CUTE AND WELL DONE….BUT I PUT ONE ON MY OWN CAR, AND IN ABOUT 2 MONTHS TIME, THE COLORS HAD COMPLETELY FADED AND IT WAS BARELY LEGIBLE.HOW DO I GUARD AGAINST THIS? Hi Mary – The two important things from this blog post related to “durability” that should be kept in mind. 1) Print method – Screen printing is the best and longest lasting without fading, but UV overlaminates can be used to reduce fading from sun exposure as well on other printing methods. 2) Check and confirm the guarantee. It is completely unacceptable for any outdoor quality sticker to fade within the first year. The company should reprint them or give you your money back. 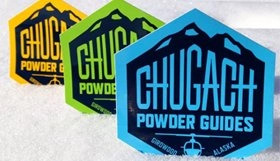 If the colors on a sticker can not hold up for at least a year outdoors in direct sunlight – they should not be advertising it as a “bumper sticker”. 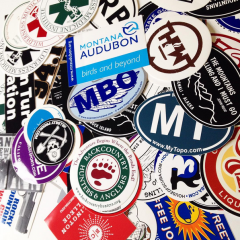 Screen printed bumper stickers last 3-5 years outdoors with no laminate used. Our VSP Digitally printed stickers last for 2-3 years (with no laminate used). i am interested in a 5 x 8 custom sticker with 2 words on it. clear background, black or white lettering. it will be used on automobile rear windshields. assuming an initial order of 50….about what range would the cost be? Hi Allen – We recommend Speed Graphics for a couple custom vinyl cut decals. Check out http://www.speedgraphics.net/store/vinyl-lettering-create-your-own.html?EN&aff_id=64 and build exactly what you need.